A range of A3 pastel coloured shades offering the feel and performance of paper but with the strength and durability of a polyester film. Suitable for dry toner based digital mono and colour copiers and laser printers. ** Duplex printing is not recommended on XE pastel shades due to possibility of show through. We recommend use of our sampling service in order to test individual colours for application suitability. Waterproof, greaseproof, tearproof, wipeable and punchable. 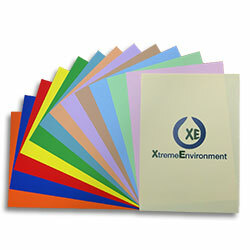 Ideal for colour personalisation and signage.